For most people, the purpose of a foot race is crossing the finish line. Considering the effort, this in itself is a tremendous thing. But why stop there? Why not expand human potential by giving each person the opportunity to do MORE good, compounding the effects long after race day? 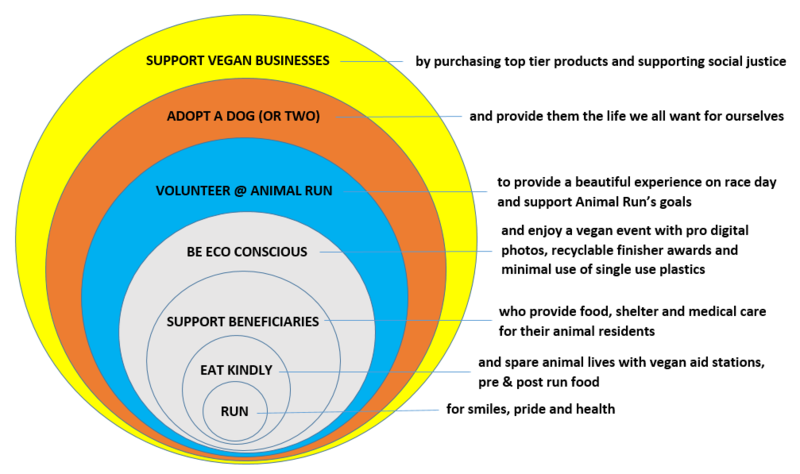 The graphic represents the Animal Run ethos; the ethos of a community creating a halo of positive impact. The first four inner circles, already significant forms of nourishing energy, are achieved just by showing up on race day. 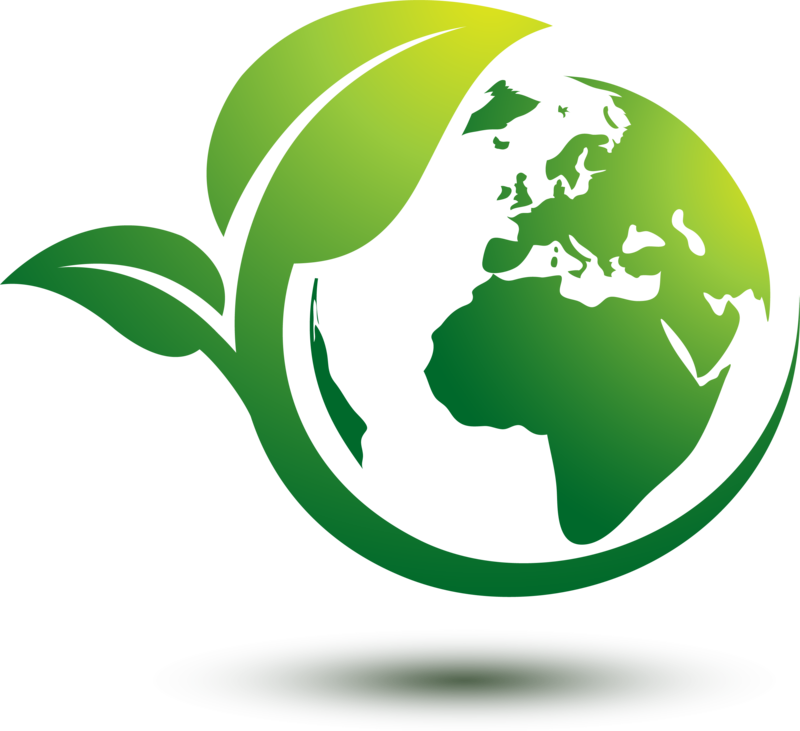 The three outer circles are optional, take more effort, but multiply the effects of creating a better, loving and more sustainable world. This is our community. Thank you for being a part of Animal Run! 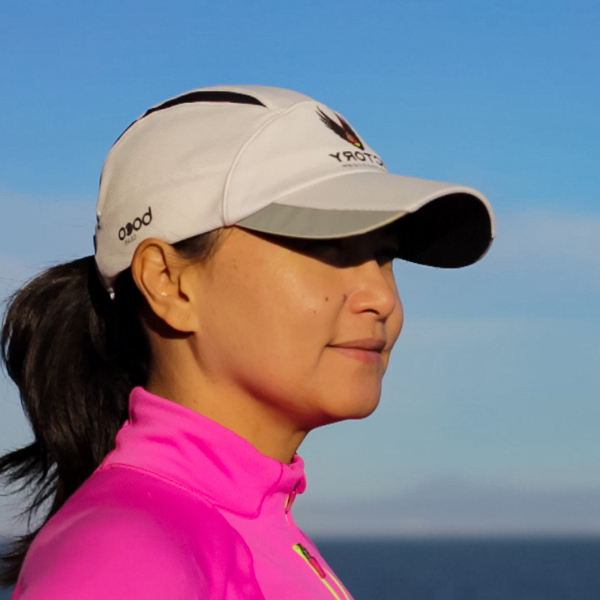 Eileen Francisco is a vegan, long distance runner and race director. She’s a Bay Area native and ex-Peace Corps Volunteer. While traveling, she notices the hungry and homeless animals on the street and has always wanted to do something to alleviate animal suffering. Through her desire to help animals and the environment and with the incredible support of family, friends and the amazing running community, the Animal Run was born. Eileen enjoys making new friends on the trails and very much looks forward to meeting you. 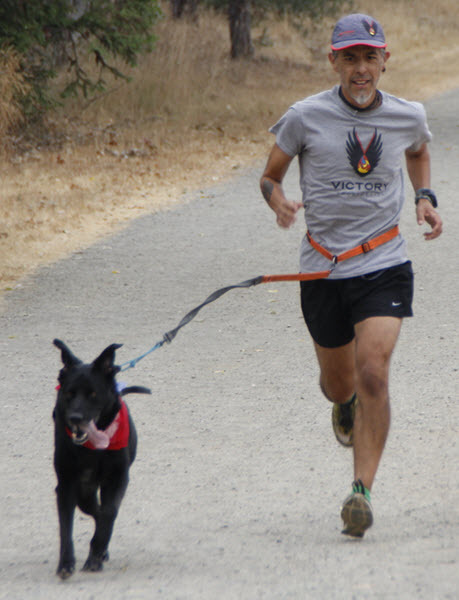 Victor Ballesteros is proud to support Animal Run. A long-time competitive trail runner, his exploits and adventures have led to the creation of Victory Sportdesign, makers of Victory Bags, the super-organized and functional all-purpose gear bags. When that’s not happening, he and his four legged teammate Lucy are racing fast and taking names! 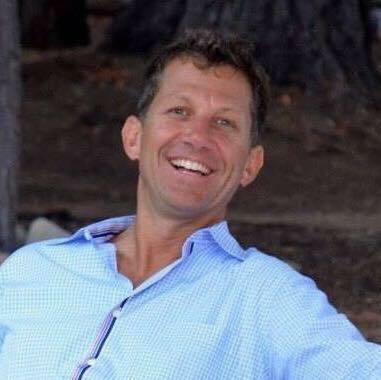 Greg Lanctot is Race Director for Pacific Coast Trail Runs. He was also President and Race Director for the USTAF Champion Quicksilver Running Club and Quicksilver 100k/50K Endurance Runs. Greg recently retired as a youth fitness and autism lifestyle expert, working with many at-risk communities to start youth sports programming and other lifestyle activities. He brings unlimited passion and wealth of event production and outreach experience to the Animal Run Board. Bronwyn Hogan has spent 25 years working in communications and media outreach, working in managerial positions at several nonprofit organizations in the Bay Area. Throughout her career, she has focused her efforts primarily in the field of nonprofit health care, channeling her passion for working to improve the lives of the vulnerable and those less fortunate. Bronwyn grew up overseas – including Belgium and in several countries in Africa – which gave her well-honed skills in languages (she is a native French-speaker) and an empathy for diversity, and other cultures. Bronwyn holds a Bachelor’s degree from the University of California, Santa Cruz, and a Master’s degree in education from San Francisco State University. 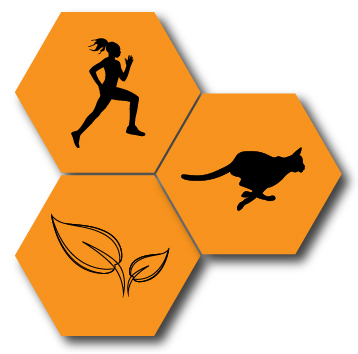 Animal Run provides fundraiser events showcasing outdoor exercise, animal kindness and environmental awareness. Animal Run does not and shall not discriminate on the basis of race, color, religion (creed), gender, gender expression, age, national origin (ancestry), disability, marital status, sexual orientation, or military status, in any of its activities or operations. These activities include, but are not limited to, hiring and firing of staff, selection of volunteers and vendors, and provision of services. We are committed to providing an inclusive and welcoming environment for all members of our staff, clients, volunteers, subcontractors, vendors, and clients. Animal Run is an equal opportunity employer. We will not discriminate and will take affirmative action measures to ensure against discrimination in employment, recruitment, advertisements for employment, compensation, termination, upgrading, promotions, and other conditions of employment against any employee or job applicant on the bases of race, color, gender, national origin, age, religion, creed, disability, veteran’s status, sexual orientation, gender identity or gender expression.